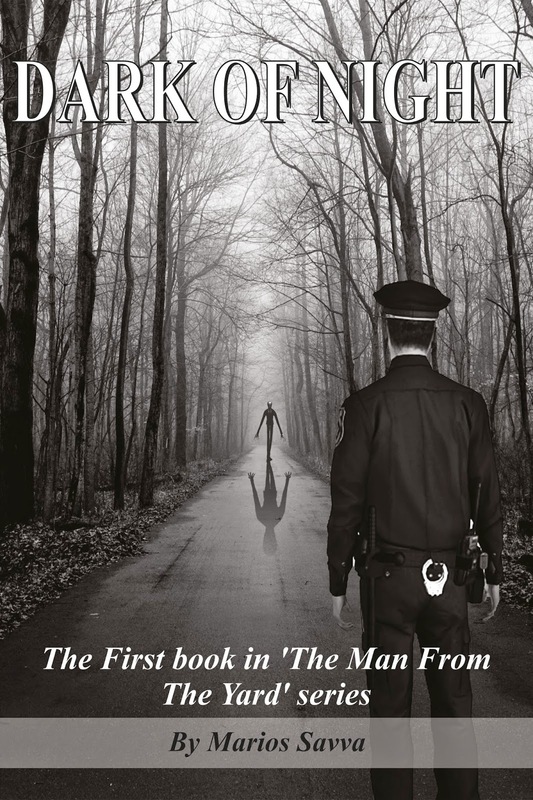 Today we are interviewing Marios Savva, author of the suspense/thriller novel Dark of Night, the first book in The Man From The Yard series. Although I am a Greek Cpriot from the island of Cyprus, I was born and raised in England. I am a psychologist. I am single. My greatest joy is spending time with my nephews and nieces. Having written a few Psychology and Health books, what got you interested in writing a suspense thriller? I used to have difficulty in sleeping so I placed my imagination in a mythical place and made up a story until I lulled myself to sleep! I have now accumulated quite a few fictional stories over the years! I have taken the decision to put my stories into print. Who do you think would enjoy reading Dark of Night? Everyone. I know this sounds like a cliche, but I believe this to be true for several reasons: One, the story is unique and captivating. Everyone loves a good story. Two, the warmth of the characters and the story of love that develops despite the tragedies, touches the heart and balances the continual suspense. It is a book that has everything, so that is why it has a broad appeal. Who was your favorite character to write in Dark of Night? Both Jake and Chief share a few aspects of my character and beliefs, so it's a tough choice. If I had to choose one, I would say Chief, because his character and convictions are rare these days. In Dark of Night, a Ouija board séance results in the arrival of an evil entity. Did you ever use a Ouija board growing up? No. Never. And I never would. But I do know someone who did, and there were consequences for him. The entity obviously plays a large role in the book, having killed Jane’s friends and pursued Jane. Without giving too much away, can you tell potential readers a little bit about what to expect from the entity? It is a dark supernatural entity that pursues and torments the participants of the séance. It is relentless in its attempt to kill Jane. It follows Jane to Whitesands and causes untold tragedies there. It is evil and a creature of darkness. How many books do you have planned for the Man from the Yard series? Do you think your background as a psychologist plays a role in how you write fiction? Yes. My insight into peoples' psyche is transmitted into the thoughts and feelings of the characters. Is there anything else you’d like potential readers to know about your novel? I believe readers will find the the story enthralling. They will endear themselves to the noblity of the characters and go through a rollercoaster of emotions – like the characters. Jake saw that Chief looked serious. Chief was always serious. He rarely showed his emotions. Jake often teased him about his expressionless demeanour by saying; ‘He shows about as much emotion as a brick wall.’ But although Chief was a sombre, contemplative sort of person, his 'seriousness' had subtle degrees of intensity; when it was a ‘10’ (Jake had his personal point scale for Chief's 'seriousness' between 0 and 10), then Jake always became worried. ‘Bobby, talk to me brother,’ Jake implored. ‘Jake ... my dear beloved brother ... one of us is going to die.’ The sheriff almost fell down in shock. Chief smiled a sad smile, nodding his head slowly, purposefully. He could see Jake, his brother-in-arms, his kindred spirit, looking confused – and worried. And Jake was worried, because he knew Bobby well enough to know that when Bobby gets ‘one of his feelings,’ he's always right. Always.